Low back pain (LBP) is one of the most common reasons for missed playing time in professional athletics, as well as a leading reason for healthcare provider visits. When evaluating patients with LBP, lumbar disc problems should be considered (see image below). Radiograph of the lumbar spine. This image demonstrates L5-S1 disk space narrowing (the most common location). Lumbar disc herniation accounts for only 4% of back pain cases  ; symptomatic disc herniations are more common in adults (48%) than adolescent athletes (11%). Acute disc herniations commonly occur in individuals between the ages 30 and 55 years  ; however, athletes between ages 20 and 35 years are at the greatest risk for disc injury,  and the L4-L5 and L5-S1 levels are most commonly affected. The vertebrae are separated by vertebral discs that are composed of a gel substance (nucleus pulposus) surrounded by outer collagen fibers, which are arranged in a crossed manner (annulus fibrosis). These discs are further supported by the anterior and posterior longitudinal ligaments. Together, the vertebral disc complex resists spinal compression. During axial rotation of the spine, the annular fibers are placed at a mechanical disadvantage. Furthermore, in forward flexion, the anterior vertebral endplates approximate, increasing the pressure of the disc posteriorly. The most common disc herniation is directed posteriorly toward the foraminal window, where the nerve roots exit the spinal canal. As such, a common mechanism of herniation in athletes is combined flexion, rotation, and compression of the spine. Football, wrestling, hockey, gymnastics, tennis, and golf are some sports in which this injury mechanism commonly occurs. In the presence of a disc herniation, forward flexion worsens the herniation. In extension, the opposite occurs. 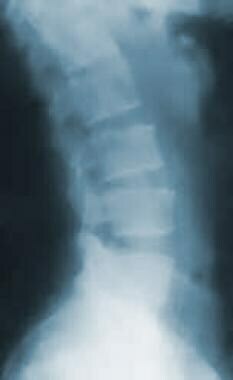 The posterior vertebral endplates approximate, forcing the disc anteriorly, to reduce the herniation. The anatomic structures that have been implicated as pain generators include the vertebral discs, nerve roots, ligaments, zygapophysial joints (z-joints), sacroiliac joints, and the musculature. Some studies suggest that discogenic pain secondary to annular disruption is the most common cause of LBP  ; vascularized granulation tissue with innervation along a torn annulus fibrosis is thought to be the cause. Inflammatory factors caused by the leakage of nuclear material from annular tears can delay intradiscal tissue healing. These factors include matrix metalloproteinases (MMPs), phospholipase A2 (PLA2), cyclooxygenase (COX), prostaglandins, nitric oxide (NO), cytokines, interleukins, and macrophages. Disc protrusion describes a bulged annulus that has not ruptured. In this scenario, there is no contact between the nucleus and the extradiscal space. Disc extrusion describes a ruptured annulus with some expelled nucleus that remains attached to the disc. Sequestered disc or complete prolapse describes a nucleus that is expelled from the disc and is no longer attached. In cycling, an incorrect seat position may predispose an individual to disc herniation. Running can cause wear and tear to the vertebral discs secondary to the repetitive trauma that is involved. Well-cushioned shoes and more forgiving training surfaces are thought to protect against disc injury. McCormack RG, McLean N, Dasilva J, Fisher CG, Dvorak MF. Thoraco-lumbar flexion-distraction injury in a competitive gymnast: a case report. Clin J Sport Med. 2006 Jul. 16(4):369-71. [Medline]. Ong A, Anderson J, Roche J. A pilot study of the prevalence of lumbar disc degeneration in elite athletes with lower back pain at the Sydney 2000 Olympic Games. Br J Sports Med. 2003 Jun. 37(3):263-6. [Medline]. Kinkade S. Evaluation and treatment of acute low back pain. Am Fam Physician. 2007 Apr 15. 75(8):1181-8. [Medline]. [Full Text]. Smeal WL, Tyburski M, Alleva J, Prather H, Hunt D. Conservative management of low back pain, part I. Discogenic/radicular pain. Dis Mon. 2004 Dec. 50(12):636-69. [Medline]. Baker RJ, Patel D. Lower back pain in the athlete: common conditions and treatment. Prim Care. 2005 Mar. 32(1):201-29. [Medline]. Peng B, Zhang Y, Hou S, Wu W, Fu X. Intradiscal methylene blue injection for the treatment of chronic discogenic low back pain. Eur Spine J. 2007 Jan. 16(1):33-8. Epub 2006 Feb 22. [Medline]. Kraft DE. Low back pain in the adolescent athlete. Pediatr Clin North Am. 2002 Jun. 49(3):643-53. [Medline]. Harwood MI, Smith BJ. Low back pain: a primary care approach. Clin Fam Pract. 2005. 7(2):279-303. Baker RJ, Patel D. Lower back pain in the athlete: common conditions and treatment. Prim Care. 2005 Mar. 32(1):201-29. [Medline]. [Full Text]. Kreiner DS, Hwang SW, Easa JE, et al. An evidence-based clinical guideline for the diagnosis and treatment of lumbar disc herniation with radiculopathy. Spine J. 2014 Jan. 14(1):180-91. [Medline]. Eck JC, Riley LH 3rd. Return to play after lumbar spine conditions and surgeries. Clin Sports Med. 2004 Jul. 23(3):367-79, viii. [Medline]. Krych AJ, Richman D, Drakos M, et al. Epidural steroid injection for lumbar disc herniation in NFL athletes. Med Sci Sports Exerc. 2012 Feb. 44(2):193-8. [Medline]. Cooke PM, Lutz GE. Internal disc disruption and axial back pain in the athlete. Phys Med Rehabil Clin N Am. 2000 Nov. 11(4):837-65. [Medline]. Schroeder GD, McCarthy KJ, Micev AJ, Terry MA, Hsu WK. Performance-based outcomes after nonoperative treatment, discectomy, and/or fusion for a lumbar disc herniation in National Hockey League athletes. Am J Sports Med. 2013 Nov. 41(11):2604-8. [Medline]. Freeman BJ, Fraser RD, Cain CM, Hall DJ, Chapple DC. A randomized, double-blind, controlled trial: intradiscal electrothermal therapy versus placebo for the treatment of chronic discogenic low back pain. Spine. 2005 Nov 1. 30(21):2369-77; discussion 2378. [Medline]. Paige NM, Miake-Lye IM, Booth MS, Beroes JM, Mardian AS, Dougherty P, et al. Association of Spinal Manipulative Therapy With Clinical Benefit and Harm for Acute Low Back Pain: Systematic Review and Meta-analysis. JAMA. 2017 Apr 11. 317 (14):1451-1460. [Medline]. Cherkin DC, Deyo RA, Battie M, Street J, Barlow W. A comparison of physical therapy, chiropractic manipulation, and provision of an educational booklet for the treatment of patients with low back pain. N Engl J Med. 1998 Oct 8. 339(15):1021-9. [Medline]. Day AL, Friedman WA, Indelicato PA. Observations on the treatment of lumbar disk disease in college football players. Am J Sports Med. 1987 Jan-Feb. 15(1):72-5. [Medline]. Deyo RA, Loeser JD, Bigos SJ. Herniated lumbar intervertebral disk. Ann Intern Med. 1990 Apr 15. 112(8):598-603. [Medline]. Dreisinger TE, Nelson B. Management of back pain in athletes. Sports Med. 1996 Apr. 21(4):313-20. [Medline]. Earhart JS, Roberts D, Roc G, Gryzlo S, Hsu W. Effects of lumbar disk herniation on the careers of professional baseball players. Orthopedics. January 2012. 35(1):43-9. [Medline]. Faas A. Exercises: which ones are worth trying, for which patients, and when? Presented at: The International Forum for Primary Care Research on Low Back Pain; October 12-14, 1995; Seattle, Wash.
Franklin BA. Low back exercises. Roitman JL, Kelsey M, eds. American College of Sports Medicine's (ACSM's) Guidelines for Exercise Testing and Prescription. 3rd ed. Baltimore, Md: Lippincott Williams & Wilkins; 1998. 116-25. Gerbino PG 2nd, Micheli LJ. Back injuries in the young athlete. Clin Sports Med. 1995 Jul. 14(3):571-90. [Medline]. Kahanovitz N. Surgical disc excision. Clin Sports Med. 1993 Jul. 12(3):579-85. [Medline]. Montgomery S, Haak M. Management of lumbar injuries in athletes. Sports Med. 1999 Feb. 27(2):135-41. [Medline]. Regan JJ. Clinical results of charité lumbar total disc replacement. Orthop Clin North Am. 2005 Jul. 36(3):323-40. [Medline]. Schenck RC Jr, ed. Athletic Training and Sports Medicine. 3rd ed. Rosemont, Ill: American Academy of Orthopaedic Surgeons; 1999. 389-90. Singh V. Percutaneous disc decompression for the treatment of chronic atypical cervical discogenic pain. Pain Physician. 2004 Jan. 7(1):115-8. [Medline]. [Full Text]. Stinson JT. Spine problems in the athlete. Md Med J. 1996 Aug. 45(8):655-8. [Medline]. Wang JC, Shapiro MS, Hatch JD, et al. The outcome of lumbar discectomy in elite athletes. Spine. 1999 Mar 15. 24(6):570-3. [Medline]. Watkins RG. Lumbar disc injury in the athlete. Clin Sports Med. 2002 Jan. 21(1):147-65, viii. [Medline]. Windsor RE. Lumbosacral discogenic pain syndrome. Medscape Reference. [Full Text]. Young JL, Press JM, Herring SA. The disc at risk in athletes: perspectives on operative and nonoperative care. Med Sci Sports Exerc. 1997 Jul. 29(7 suppl):S222-32. [Medline].